The V2 Aero roller skis are the most versatile roller skis available. 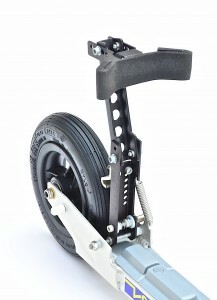 The 125mm (5″) pneumatic wheel will roll over terrain that would be impossible to navigate with smaller, hard wheels. The V2 Aero roller skis are the most versatile roller skis available. 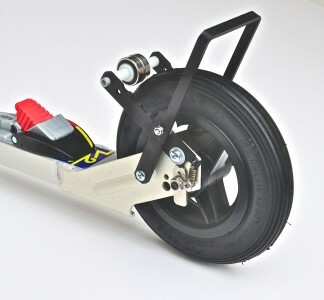 The large diameter pneumatic wheels can be used on surfaces where it’s impossible to roller ski on smaller diameter solid wheels. The skis can be used on dirt roads, limestone bicycle paths, chip seal pavement and on grass. 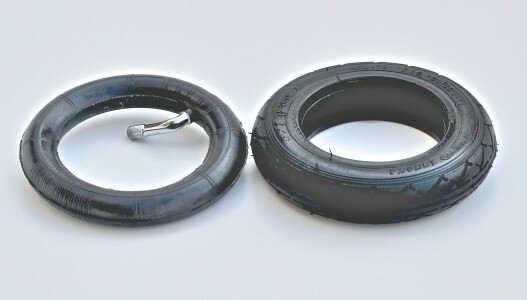 On normal pavement the pneumatic tires provide an extremely smooth ride.Many users consider the Aero safer as they will roll over debris that can stop smaller wheels. Another major benefit is that the Speed Reducers on pneumatic tires are much more effective than when used on solid rubber wheels. Because the Speed Reducers are so effective on the Aero the skis have become popular in very hilly or mountainous terrain. The XL125S is much like the XL150S but uses a smaller 125mm (5”) wheel, which makes it about 200 grams lighter than the XL150S. Some skiers find it is easier to balance on. Lighter skiers and those with very good technique prefer it to the XL150S, but skiers over 160 pounds will want the XL150 as the larger wheels wear better and are more reliable. The split rim construction of the W125 negates any need for our Tire Station when changing out tubes and tires.